Lingenfelder is located in Europe. The greater part of it combines low elevations with low relief; about three-fifths of the land is at an elevation of less than 600 feet (180 metres) above sea level, and another one-third is between 600 and 3,000 feet (180 and 900 metres). Europe can be divided into two major parts—western peninsular Europe and eastern continental Europe. Europe is a well-watered continent with many rivers but relatively few sizable lakes. Most of the continent’s drainage finds its way to the Atlantic Ocean via a number of master river systems, whose watersheds interlock in a most complex manner. Four major regional climate types can be distinguished: the maritime climate of the west with abundant rainfall and mild temperatures both in the winter and summer; the transitional climate of central Europe with 20 to 40 inches (500 to 1,000 mm) of annual rainfall, cold winters, and warm summers; the continental climate of the northeast with 10 to 20 inches (250 to 500 mm) of annual rainfall, long and cold winters, and hot summers; and the Mediterranean climate of southern coastal Europe with moderate rainfall (20 to 40 inches), mild and wet winters, and hot and dry summers. Lingenfelder is located in Germany which ranges from the Alps in the south across the varied country of the Central German Uplands, and then northwards to the North German Plain, or Lowlands. The republic has a maximum north-south extent of about 520 miles (840 kilometres), between latitudes 47° and 55° N, and an east-west maximum (across the middle of thecountry) of about 385 miles (620 kilometres), between longitudes 6° and 15° E. It has an area of 137,828 square miles (356,973 square kilometres). Germany is favoured with a generally temperate climate, especially in view of its northerly latitudes and the distance of the larger portions of its territory from the warming influence of the North Atlantic Current. Extremely high temperatures in the summer and deep, prolonged frost in the winter are rare. These conditions, together with a more than abundant and well-distributed amount of rainfall, afford ideal conditions for raising crops. The Pfalz and the Haardt Mountains form one of the great tourist areas of Germany complete with scenic drives, wonderful cycle and hiking paths, and a sophisticated hospitality industry. The Deutsche Weinstrasse (German Wine Route) is an 80 km scenic drive that runs from Bockenheim in the north to Schweigen-Rechterbach in the south – it is the oldest demarcated wine tour in the world. With an almost Mediterranean climate it is no surprise that crops other than grapes also flourish including almonds, peaches, cherries, sweet chestnuts, walnuts, figs and many vegetables including asparagus and chicory. 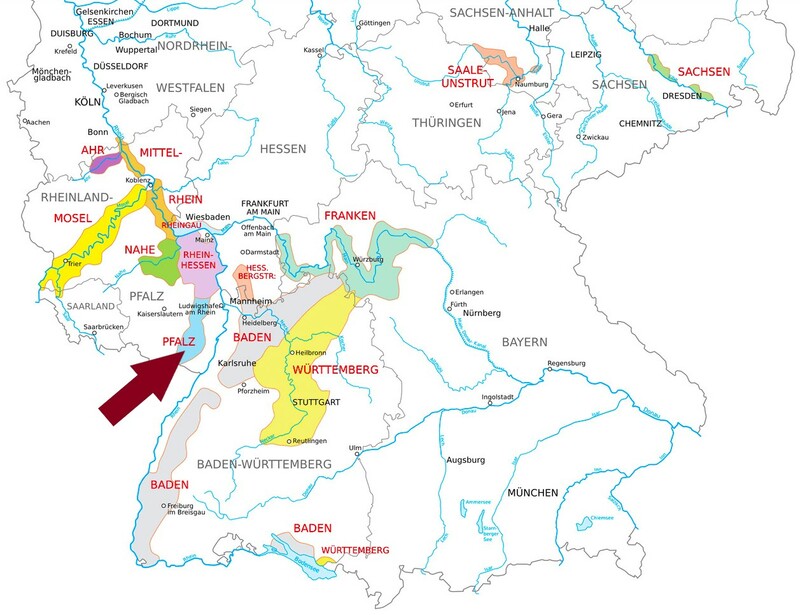 Like so many things, the establishment of the wine culture in the Pfalz is owed to the Romans whose legions occupied the area in the 2nd and 3rd centuries. Archaeological excavations support their early viticultural enterprise – an example is ruins of a Roman winery just to the south of Freinsheim. Fortifications were built, some say, for the protection of wines rather than property, and the practice of demanding wine as rent from the farmers on the extensive monastic lands helped sustain a wine industry. Accounting records of the Lorsch and Weissenburg monasteries provide definitive evidence of wine production in Grosskarlbach from as early as the year 763. Lingenfelder is located in the Grosskarlbach which is about 50 kilometers south of Mainz and 20 kilometers west of Mannheim (about 7 kilometers past Frankenthal). Grosskarlbach is a small village with quaint, modest homes in the classic European style. Some are set back slightly from the road with small grounds but many homes toward the center of town rise as walls from the sidewalks of the narrow streets. Signs advertising apples and wine abound. A small ceramics factory faces the central church.